I get a lot of questions about the tags I use at the bottom of most of my posts. I used to feature two sets of tags, one for Technorati tags and the other as navigation tags to search my site. Up until recently, these were created from a text file I kept open all the time with my tag list all laid out. I’d copy and paste the tags I wanted into the bottom of each post. Well, now I don’t have to. While this tagging bookmarklet works great as it is, the look of the tags is controlled by a <span> CSS tag. With the full version of WordPress, you can customize the look of the tags, but in WordPress.com blogs, all that code is stripped away. So what do you do? We’ll get to that. Stay tuned. Note: Now there are two versions of this Tagging Bookmarklet. There is the first version which includes pluses (+) between the linked combined tag phrases and a space between tag words, and another version that shows only a space between linked combined tag phrases and a comma between the the tag words. To use, go to Oddiophile’s Rather Fab Technorati Tags Bookmarklet and click and drag the Oddiophile’s link to your sidebar or tool bar. A link will appear. While writing a post in the WordPress Write Post panel, click the Oddiophile bookmarklet link. In the popup window that appears on your screen, enter the Technorati tag names you want to use. Do NOT use commas, only spaces to separate the words. To use multi-word phrases as tags, put a + between the words such as wordpress+plugins (Unless using the newer version listed below which does not use the + sign and does use commas to separate the words). In the next window, copy the text with the copy shortcut keys CTRL+C. Move your cursor to the point in your post where you want the tags to appear. Paste the text with the paste shortcut keys CTRL+V. 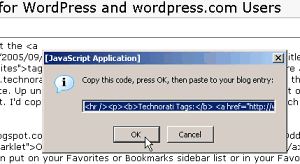 That’s all it takes to put Technorati tags in any full version WordPress post. That’s right. I hear the brakes squealing. You are using the limited version of WordPress called WordPressMU and WordPress.com. You want all the joys of easily adding Technorati tags to your posts, right? Well, Lorelle is here to make your day. The problem is that Oddiophile’s Technorati tagging bookmarklet just isn’t very pretty with WordPress.com blogs. It puts the tags in a <span>, dependent upon CSS stylesheets to style its look. Unfortunately, the powers behind WordPress.com have stripped away all our abilities to add CSS and HTML tags other than the most simple and common tags to our posts. It just looks like part of the text. So we use our creativity and the tools we do have access to and make this tagging thing look pretty. The key is to put in whatever HTML and style tags you can get away with. Make sure you have the Oddiophile’s Rather Fab Technorati Tags Bookmarklet in your Favorites or Bookmarks. Right click the bookmarklet link and choose Properties. Move your cursor to the Location block. With your keyboard, press CTRL+A to select the whole code, or just select it with your mouse. Make sure you get all of it. Make your changes and edit the code. Copy the newly edited code. Right click on the Tagging Bookmarklet on your toolbar or links and choose Properties. Select the old code and delete it. Paste in the newly edited code. Click OKAY and then test drive the new code. If it doesn’t work when you test it, it could be because you accidentally deleted part of the code, the quote marks have been turned into “pretty quotes” by WordPress.com (search and replace them to make them plain quote marks), or the tags you are using don’t work. If it works, do a little dance and have fun with this. In my tag list, I use a horizontal line to separate the tags from the post. Then in a paragraph, I list the title in bold, followed by the tag links. At the end I include a copyright notice and two graphics, one for my signature and one for 9Rules, of which I’m a member. Very simple. The following is my full Tagging Bookmarklet with all my customizations. Let’s look at this piece by piece and I’ll show you how you can change this to make it your own. You can set the bookmarklet prompts, the text you see in the pop-up windows, to say whatever you need it to say to help you remember what you are doing and how to do it. For instance, I needed a reminder to not use commas, so I added “Enter Tags without commas” to remind myself. to whatever you would like it to say. Since the bookmarklet code is pasted into your blog post, the code will appear in your blog feeds. To make the links valid, clickable to your blog search “tags”, the full URL of your blog must be included in the tag links. If you would like the images in your “signature” included, make sure the links are also full absolute URLs in order for the images to load in the feed readers. Note that all quote marks within the code don’t quite look like themselves. They are represented by '+unescape('%22')+'. This allows them to pass through the programming code as quote marks, not influencing the code itself. Take care not to delete any part of the code outside of the elements you want to change. If you do, and the bookmarklet won’t work, start over and make sure that you are extra careful with all those characters. I encourage you to use your imagination and have fun with this. I’ve added two graphics, a signature and the 9Rules logo, but you can add anything you want. A photograph, a cartoon, your signature, a doodle, whatever you can create with a graphics program. I do recommend that you keep the file size low to allow the graphic to load fast, and that the graphic you choose doesn’t screw up your layout, but do whatever you want. Be creative. To add the graphics, I put them at the end of the paragraph tag, but you can add them anywhere. Just remember to use the '+unescape('%22')+' in place of any quote marks around the image links and alt tags. I used relative links to my graphics, but you can also use fixed links such as http://example.files.wordpress.com/2006/03/sig.png. It doesn’t change things, just lightens the code load. As I said, you don’t have to use links to Technorati in your tag links. You are not penalized or punished in any way for using any URL in your tag links. They can be off-site or on-site (intrasite) links. I personally prefer to keep my visitors on my blog, so I use intrasite links. Simply replace the URL link with your tagging service of choice. This should get you started designing your own tags with the Tagging Bookmarklet. There are a lot of things you can do like add a comma or pipe [|] or asterisk between the tag words. If you come up with some neat designs, ideas, or other places to link your search tags to, please post a link here so we can check it out. Remember, you can find More Must Have Bookmarklets Than You Can Swing a Bookmarklet At also on this site, and if you have any favorite bookmarklets of your own, please post them there so we can add to the list. Thanks, Lou, for the great scripts! They will really help folks. And for the rest of you, this is just another example of the magic of the WordPress Community and its determination to work together to create great things. Amazing. Rakesh of Bavra Mann has developed a version of my Technorati Tagging Bookmarklet that finally fixed what I haven’t had time to fix. You can now use commas as you enter words, without the plus sign to connect them together, and in the pasted version, there are no plus signs between the words. His version is at Rakesh’s Technorati Tags Bookmarklet with Commas and Spaces, and here is a detailed look at how to break it down to incorporate your own layout and code. It’s meant as a guide to use to create your own tagging bookmarklet. See Rakesh’s blog for this new version’s full code. The next section handles the search and replace technique that replaces the need for the + sign. The next section wraps the tag links around the tag words. If you are using WordPress and wish to feature your tags as site search tags (highly recommended), then leave this as http://lorelle.wordpress.com/index.php?s=. If you would like to replace the tag link with an off-site tag service, then carefully change it to one of the other links mentioned above. Remember, the +unescape('%22')+ represents a quote mark, required for these links to work. Do not remove or edit them. The final section adds the last prompt in the tag popup window. You can change this to say anything you want. Thanks, Rakesh, for this great variation! It won’t work: As mentioned, make sure there are no quote marks in the code. Remove all line breaks so the script is on one line. Take care in editing or modifying this as one missed bit of code and it won’t work. Keep backups as you modify it. Is this available as a WordPress Plugin? No. 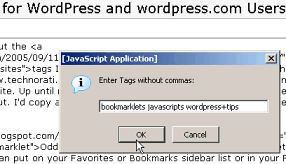 It is a Javacript bookmarklet and not a WordPress Plugin. It is saved to your browser and has no connection with WordPress or its base code. I’d like to add my picture to the signature area: You can add any graphic(s) you want to the script in the format outlined. Will this work on Blogger or FaceBook blogs? This technique will work on any blog, not just WordPress blogs, as long as the blogging program will not strip out HTML code. It works from within your browser not your blogging program, so you should be able to use it on anything. This entry was written by Lorelle VanFossen and posted on October 14, 2005 at 8:12 am and filed under blogging tips, WordPress, WordPress News, WordPress Tips, WordPressDotCom with tags how to use wordpress, wordpress, wordpress help, WordPress News, WordPress Tips, wordpress tutorials, wordpress.com. Bookmark the permalink. Follow any comments here with the RSS feed for this post. Post a comment or leave a trackback: Trackback URL. AND it will apply to both my normal WordPress blog AND my WordPress.com blog. but what about your site search tags. all the tags point to error 404 pages? Good catch on the site search tags for this post. When I wrote it, wordpress.com allowed me to use a straight “index.php” relative link. Now, for whatever reasons, I have to use “/index.php” in my relative links in order for them to work. I have changed a lot of them, but of course, as the odds would have it, the one post in which I need them to work per example, I must have missed. Gads, I wish wordpress.com had database search and replace functions! Why should your suggestion be added? It works fine without so I’m curious. Oh, BTW, I’ve made a Greasemonkey userscript based on the bookmarklet above. Ah, I’ve hit cancel and never noticed the error. Good point. I’ll change the code. Thanks! lou that gm script rocks. so lorelle what would be the js for adding site tags? nevermind. sorry for th last comment. i missed “index.php”. Thanks for reminding me to put emphasis on the use of the “/index.php” in the links and such. I’ve updated the article to for more clarity on creating site search tags. I made another GM scripts as you suggested. Lou, you are a star! I added the scripts to the post above. Thanks so much. I just adore how great minds work together in the WordPress Community! Sorry, my slow brain still isn’t following this last js block. If we copy your js code block, change the cameraontheraod link, use our graphic for the seperation line and edit the copyright names, do we add it to our index.php where we want it to appear for each post, and doing so will auto-magically grab link words to use, or do we insert this type code at the end of each post modifying the links to use the search words we want for that post? With the above mods, I got a 404 while it was in the preview window, not sure what would happen if I went “live” with it. Sorry, and TIA. To use it, simply click the link in your browser Links or Bookmarks bar and it will pop up to allow you to enter in the information, as the rest of the instructions explain. Then copy and paste the information in the bottom of your post. If you are using the full version of WordPress, I recommend that you do not use this method but use the Ultimate Tag Warrior WordPress Plugin instead. It is much more powerful, more automatic, and easier to use. You can also create a tag cloud or heat map with it, adding more navigational aids to your blog. This technique is for those running WordPress on WordPressMU like WordPress.com, or who are nervous about Plugins or editing their template files. I’m currently only including site search tags in my posts, but I’m going to include Technorati tags also. I was thinking about adding target=’_blank’ to the Technorati tag links to force their opening in a new window. Would that interfere with Technorati when it gathers site info? Would it hurt SEO? And, going back to my previous comment, would including a target=’_blank’ attribute (supposing it doesn’t interfere with either Technorati nor SEO) be considered a rude way for making people stay on your website? I prefer opening links in new tabs in Firefox, so I can do some “parallel browsing”. But there are still all those other people who use IE… Anyway, what do you think about all this? One last thing. Do you know if there are any guidelines for tagging in Spanish? Would tagging with “compañía” be the same as “compania”? I guess the same thing would apply for tags in French, Dutch, or any other languages with strange symbols on their letters. The tag is the word in the link text, not in the link itself. So the “tag” ready by Technorati, Google, Yahoo, or anyone else is “tag” in <a href="/index.php?s=fred">tag</a> in the most simplistic explanation. It doesn’t matter what the link says. It’s the word linked. Links to Technorati are links that benefit Technorati’s page rank. They do not benefit you. They only give links to Technorati tag search results if you want your users to get more information from other sites listed with Technorati on the same topic. If you want them to stay on your site first, then list your tags with site searches. Using target="_blank" is considered bad manners now for just about anything. I used to use it for all links for external sites, but found that this was just bad manners. It does nothing but open the link in a new window or tag. Search engines ignore it. A lot of people who want to open up more than one window or tab understand how to RIGHT CLICK > OPEN IN NEW TAB or WINDOW and use it. They don’t want websites to control their windows. Guidelines for tagging in Spanish? Hmmm. Good question. I think that those using the language tag service of their choice would use the “spellings” of the words as they are normally found, with the tilde and accents. You’ll have to check with them to see what their tag lists/heat clouds have to offer. Please let me know. SEO or page ranking is not measured by your tags, BUT links to tag search results can make those end resulting pages end up in search engines. I have done searches on Google and found one of my site search tag results pages listed with a listing of the posts related to that tag. That was cool. So it actually can help get more of your “pages” in search engines because the search engines “think” they are pages. As for page ranking, that’s more complicated. See How Google Ranks Websites for the specifics on how that works. And Do It Yourself Search Engine Optimization for more info. would indicate the tag “tech” rather than “fish”. I agree with you on the behavior of the people who know how to open a new tab/window and I’m also one of those who doesn’t like to be sent off somewhere else. So my idea for making tags open in a new window has been discarded. As for the different languages, I still haven’t found much info on that, but I’ll let you know when I know more. I did a search on Google using both cumpleaños and cumpleanos and it returned similar, although slightly different results. Then i searched for tag:cumpleaños and tag:cumpleaños and got exactly the same results, but with some differences in the order that were presented. After that, I did the same thing on Technorati and got totally different results on both the normal search and the tag search. So my preliminary conclusion is that tag searching using Technorati is much more sensitive than a Google search (and probably most other search engines). I’m a big fan this website. You’re a great writer/blogger. Thanks a lot for your help. That’s the issue involving clicking the link to the tag. There is a difference. The link needs to be a “real page”. That’s where the “should” comes into the picture. That helps get the tag page (search results) created with a tag such as https://lorelle.wordpress.com/tag/writing or https://lorelle.wordpress.com/index.php?s=writing into search engines which can follow this link to find a legitimate page, as can users. So not only your post gets into search engines, your valid tag page gets into search engines. All links are required by web standards to be valid, so this is where that comes from. Also, the idea of the link representing the tag just doesn’t hold. <a href="http://www.wordpress.org/support" rel="tag">WordPress Support Forum</a> is a valid link to a valid potential tag. People will search tag services for “WordPress Support Forum” and hopefully find it. The link doesn’t include “WordPress Support Forum” but it is still a valid link. The tag is the text. Does that help you understand this a little better? Again, let me emphasize that Technorati and other tag services are pinged when you publish your post on WordPress automatically. They come crawling through, find some tags with your categories and any other you have listed, and gather in ALL the content on your website, not just tags. When people use Technorati to search, they will find your site through the keywords as well as the tags depending upon if they do a general search (most common) or specific tag search. They still find your work. I find providing tags as navigational aids much more intuitive and helpful for my readers than saying “Hey, I got nothing here – go see what everyone else has on Technorati.” 😉 I adore Technorati and how they have changed the face of the web and Blogosphere, but I want my readers to stick around before they head over there. I think I got some good stuff here, too. Hee hee. Good research on the foreign language words. I’m sure that Google will not be as sensitive to the alphabet distinctions, so that is a great test. THANKS. Glad to help and thanks for keeping me informed. If you have a rel="tag" in your web page, no matter where it is, no matter who it links to (it can link to this blog for all it matters! ), Technorati and any and all tag-searching search engines and web crawlers will find it. It doesn’t have to be be a link to Technorati. Google now searches tags, so should you have the link be to Google? Why not have three or four sets of links to the different tag searching services? All these tag searching services find your tags and all you need is the rel="tag" to be found. Does that make sense? Now, if you want to help your visitors find information offsite, like Technorati, Google, Yahoo, Raw Sugar, del.icio.us, Digg, or anywhere else on the Internet planet, then make the link to those locations to help your visitors, not you! Glad to know, and it is traditional to honor the name of the blog as part of the linking process, so how should I properly handle the two? Thanks again! Hi Lorelle, i’m currently using utw tags, but many visitors do not know that they function as a rag search as well as the usual blogsearch. Do you know a way how to make it clear? To designate which tags stay on-site and which lead to off-site locations, name them. I use Site Search Tags for those and Technorati Tags for those. Label them what they are. Is that the default– “+”s between each word in the phrase for how the tags appear? Or did I do something wrong? I appreciate any quick feedback. Where is a good blog site/URL to try and search for a phrase that matches one of my tags (clarendon+va) and see if it works? Jay: Part of learning how to do these things is to read the whole thing. The information on customizing your tags is spelled out very simply. There are two choices now: one with the plus (which is actually fairly common) and one without. Thank you Lorelle. Your code’s saving me precious time everyday instead of writing those dang html codes for the tags daily. Tagging is an important part of blogging. Thank you for sharing, Lorelle! you did a very good job and i thank you from the bottom of my heart for making all this info user-friendly and free. Thanks a lot for the bookmarklet! But how can I include the subscription and e-mail links you have added? Thanks! Edit the bookmarklet and add them yourself, following the instructions included in the article. They are a natural function of your blog. Just find the links and add them. Play with it. i’ve tried and success. Now i used it in my own blog now. I always had digg tags at the end of mine, but i will add Technorati tags as wellnow i think! You can add Digg, StumbleUpon, or even Technorati Tags to your blog, but do remember that they do different things. Digg and StumbleUpon and similar site submission sites take the linked to page as your recommendation to others. A Technorati tag takes the visitor off your blog and to Technorati’s site to find “related content”. If you want them to say around a while longer, use the site search option instead of sending them to Technorati where they may not find what they want. NOTE: WordPress will soon feature built-in tags in full versions of WordPress. We are waiting to see it here on WordPress.com. So this bookmarklet may soon be obsolete. Just a quickie to be one of the heaven-knows-how-many to thank you for this post. Blinking Brilliant, and within a couple of hours I’ve got a tagging system set up which does exactly what I want it to do. I simply cannot thank you enough. A couple of hours? Huh? I wonder why it took so long. I’m lad it worked for you, but it should have been only a few minutes. If there is a way to speed this process up, please let me know. And thanks! Thanks for an informative posts. I was quite new in blogging and I am looking on how and why people use tags on their blogs. Now I’d say I am a bit enlightened by its use. Anyway, I am off for more reading and researching about blogging. Just thought I’d say thanks to your great tip on tagging. Is there a bookmarklet like this one or something similar that can be used to have categories only search my WordPress.com blog? I’d like to use both categories and tags and have both only navigate through my blog. You can modify this one to include categories, but categories are automatically generated by the WordPress Theme you choose. code with HTML. I’m starting a blog soon but have no coding skills so I wanted to get guidance from someone with experience. Any help would be greatly appreciated! Depends upon the publishing platform, but today everything is WYSIWYG if you choose to use that feature. Coding skills have not been necessary for over ten years.